New home sales rebounded unexpectedly last month, but were still the second-worst on record and remained well below last year's levels, according to data released Wednesday. The Commerce Department said sales rose 4.7 percent in February to a seasonally adjusted annual rate of 337,000 from an upwardly revised January figure of 322,000. Even after the revision to January's sales results, the month remained the worst on records dating back to 1963. Economists surveyed by Thomson Reuters had expected February sales to fall to a pace of 300,000 units. "Low mortgage rates coupled with the decline in home prices is putting a lot of affordability at the disposal of prospective homebuyers," Greg McBride, senior financial analyst at Bankrate.com, told CBS News. February's sales were still down by more than 40 percent from the same month a year earlier. The median sales price fell to $209,000, a record 18 percent drop from the same month last year. The median price is the midpoint, where half sell for more and half for less. At the current sales pace, the government said it would take a year to exhaust the supply of new homes on the market. The glut of unsold homes and competition from deeply discounted foreclosed properties puts even more downward pressure on prices and on builders' profits. "There's a lot of uncertainty with regard to the economy. Prospective homebuyers are uncertain about their job status and may be reluctant to take the plunge. There's also a tremendous amount of inventory on the market," McBride said. Fallout from the housing crisis is one of the biggest problems facing the country. It has played a central role in the U.S. recession, now in its second year. Foreclosures have spiked, financial companies have racked up multibillion-dollar losses and home builders like Pulte Homes Inc., D.R. Horton Inc. and Lennar Corp. have been clobbered. Investors, however, cheered at the new home sales numbers and bid up shares in the major builders by 7 percent or more in morning trading. 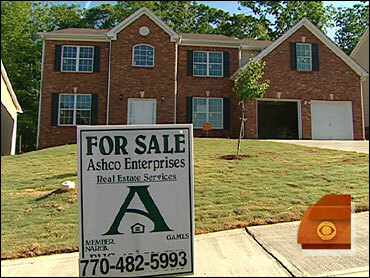 To lure buyers, President Barack Obama's stimulus package included an $8,000 first-time homebuyer tax credit. Plus, the Obama administration has unveiled a $75 billion plan to curb foreclosures, which are aggravating problems in the housing market and the overall economy. In February, sales rose 9.7 percent in the South from a month earlier, and 6.6 percent in the West. They dropped 9.1 percent in the Midwest and 3.3 percent in the Northeast. Sales of previously occupied homes also jumped unexpectedly in February by the largest amount in nearly six years as first-time buyers took advantage of deep discounts on foreclosures and other distressed properties. The National Association of Realtors said Monday that sales of existing homes grew 5.1 percent to an annual rate of 4.72 million last month, from 4.49 million units in January.